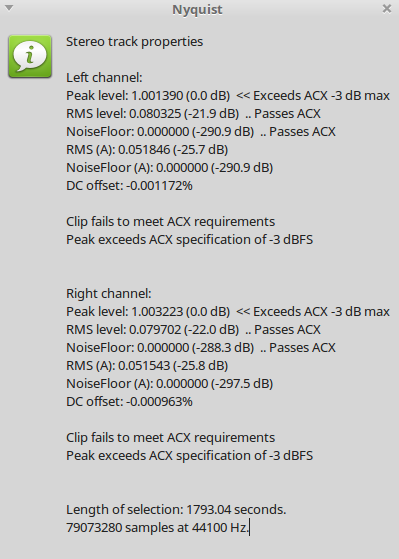 First I used a plugin for Audacity called ACX Check Values, which reports the maximum value of the podcast and some other useful parameters. The reasoning for the ratings is explained here. The first step was to normalize to provide a fairly constant ratio of spoken amplitude to the amplitude of the spaces between the words. To count the silences, I ran “Silence Finder,” which generates a tag track with all the discovered silences. Exporting that tag track and counting the lines gives the number of silences (moments quieter than -3o dB and longer than 300 msec). This is a typical BBC article break: 1.13 seconds long. This would get truncated as a silence. 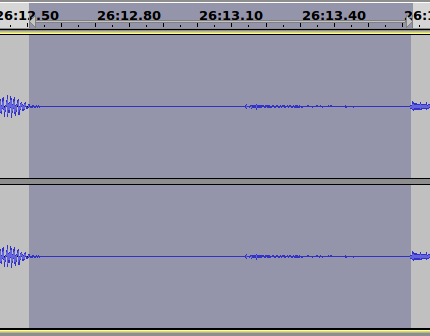 This is a typical BBC announcer word break, about 50 msec. By comparison, here’s a typical “The Daily” word break: 874 msec. Shorter than an article break on the BBC but about 30x longer than a typical BBC word break. No wonder The Daily sounds like they’re on Quaaludes. 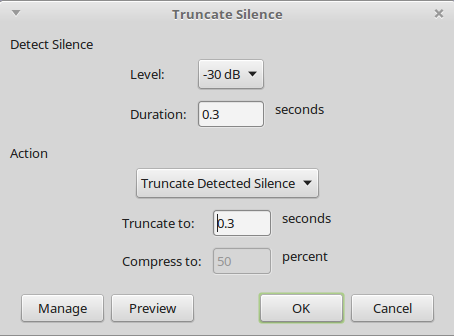 The next step was to truncate silence with the built-in filter. It takes any silence consistently lower than -30 dB and longer than 300 msec and cuts it down to 300 msec. 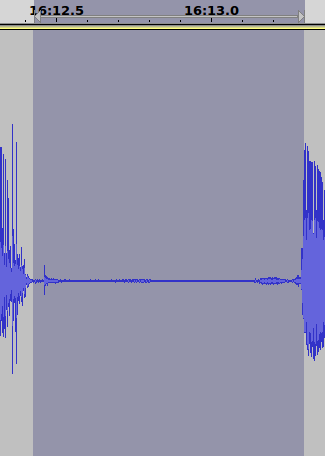 This makes the pacing on The Daily sound almost normal, though the tempo is still bizarrely slow. There are some podcast tools that have automatic silence skipping, but BeyondPod isn’t one of them. It does allow speedup, which also speeds up those annoying silences, but they are still odd. The result is a very staccato speech style with normal or slightly fast pronunciation of the words with weird gaps between them. And sped up 75% so it sounds kind of normal. Listen to the first sample again after playing this one. Length of selection: 1950.72 seconds. 86026752 samples at 44100 Hz. Length of selection: 1945.41 seconds. 85792581 samples at 44100 Hz. Length of selection: 918.544 seconds. 40507776 samples at 44100 Hz. Length of selection: 876.581 seconds. Length of selection: 1793.04 seconds. 79073280 samples at 44100 Hz. Length of selection: 1642.53 seconds. 72435516 samples at 44100 Hz. Length of selection: 938.588 seconds.